Most camps are Monday through Thursday (one is Tuesday-Friday), 9 am to 3 pm, ages 6-10, $390. Mermaid Camps are back!! Scroll through this page to see what Pam will be offering this summer. Enrollment is Open!!! Looking forward to seeing you this summer for more creative and watery fun! Pam is SO excited to be offering small and wonderful Mermaid Camps at her cute home studio in Old Town in RVR in Carbondale for a second summer! We begin each day doing wonderful mermaid art projects. Then we have a relaxing picnic and movie time at Pam's place, and then walk the short distance to the RVR kids' pool to play and swim. Pam will even teach the children some basic synchronized swimming moves. Visit the gallery from last summer to give you an idea of all the fun we will have! Camps are small and can be viewed more as an amazing creative retreat, rather than a large bustling camp. 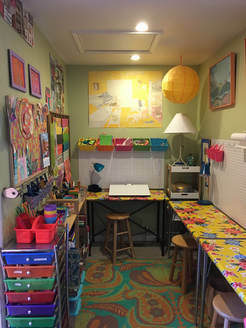 Pam's home art studio is cute, colorful and beautiful and perfect for children who benefit from having their own work-station in an orderly space. ​Children will have a great time, and will end each day feeling refreshed, happy and delighted with what they've created and learned. * Mature 5 year-olds will be considered on an individual basis. Contact Pam if you're interested. ​• 9:00-Children are dropped off at Pam's home studio in Old Town, in RVR in Carbondale. • 9:15-11:45- We do fun art projects in the morning. 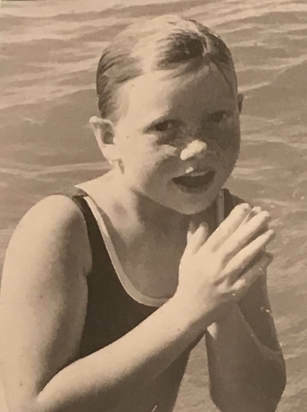 • 3:00- Pam typically gets the children popsicles or ice cream at the RVR Snack Shack and then parents pick up their little mermaids in front of the RVR clubhouse. FYI- This year children will not have time for a shower before they are picked up at the end of our day. There are still spots available in the Rose Mermaid, Mango Mermaid, and Indigo Mermaid Camps!! FYI: • Pam is offering a 10% sibling discount (siblings in the same camp). The code for that is, SiblingDiscount . • Pam is also offering 5% off when students sign up for two or more mermaid camps. That code is, MoreMermaids . ​• You can only use one discount code, so if you have siblings use that discount rather than the other one. • If you have any questions, please contact Pam. There are still spots in the following 3 camps! Make colorful, imaginative mermaid mansions where your magical mermaids will live. Create 3-D sea creature sculptures, and delightful mermaid diaries that you'll fill with your secret dreams, whimsical watercolors and colorful collages. You'll love this super-creative camp! Create your own special, soft mermaid doll out of felt, ribbons, yarn and other pretty materials. Make beautiful wavy weavings out of vibrant papers and sparkly treasures, have fun making and playing with your own miniature sea sandbox, and create a delightful, fantastic fish out of wire, buttons, and more. A delightful camp! Make imaginative mermaid treasure boxes out of little wooden crates, colorful papers, foam, paint, glitter, gems and other colorful materials. Create beautiful beach chimes out of beads and real starfish, sand dollars and shells. You'll also make very useful marine-life memo-boards, mermaid bath salts and other treasures. Yay!! The following camps are sold out. Contact Pam it you'd like to join a waiting list. And- occasionally Pam will let 1 or 2 additional children into a camp, depending on the situation. Thank you! Lemon Mermaid Camp, June 24-27, Monday-Thursday, SOLD OUT! Make adorable and whimsical mermaid gardens filled with sand, shells, sea glass, and clay mermaids and sea creatures. Sew soft and snuggly sea turtle stuffed animals, create colorful and fun fish lanterns, and make bold South Pacific prints to hang on your walls at home. You'll have a great time in this amazing camp! Emerald Mermaid Camp, July 15-18, Monday-Thursday, SOLD OUT!! In this super-fun camp we spend the week preparing for our final day Under-The-Sea Mermaid Party. We make awesome mermaid crowns and jewelry that we place in our sunken treasure chests for a treasure hunt, printed mermaid placemats and invitations, sea creature sugar cookies and a mermaid castle cake, mermaid decorations, and more!! A great class for party lovers and future party planners!! Turquoise Mermaid Camp, July 22-25, Monday-Thursday, SOLD OUT! Make amazing flower mermaids out of wire, ribbon, yarn and other beautiful materials. Create your very own mermaid-tail beach bag, piece together shells, sand and sea glass and create a beautiful mermaid mosaic tile, and make an assortment of painted and collage mermaid cards for family and friends. A wonderful camp! • We'll watch a mermaid movie, do more mermaid art projects and play mermaid games at Pam's in RVR. 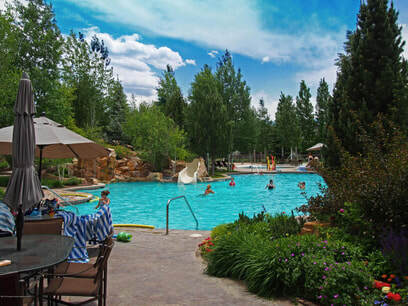 • If we're already at the RVR pool and there's a cloudburst, we'll do some mermaid activities at the Clubhouse. • If there's a lot of rain in one week, we'll plan other excursions- e.g. to the library, the rec. center, etc. • & If it does rain a lot, Pam will schedule a few other afternoons at the pool and will invite students to join her. • Pam will work out the details and will be in touch with parents about these plans if necessary. ​ready to dive back under the water. Mermaid Camps are for children who are comfortable in the water and have had some swimming instruction. RVR has a lifeguard on duty, and Pam will also be at the pool supervising the children. Pam is an excellent swimmer and has taught children's swimming and synchronized swimming classes, was on the C.U. Boulder Synchronized Swimming Team, and has been on a few master's swim teams as an adult. So, rest assured, your children will be well-supervised at the pool and will have a great time, and will learn something too! If children have mermaid tails that are easy to put on, they are welcome to bring them to the camp.